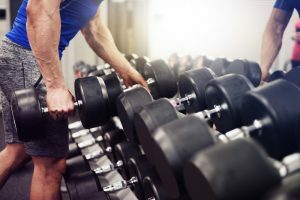 Depending on the type of gym you use there might be various machines or a limited number of machines, but machines to use nonetheless. It’s crucial that after your workout that you wipe down the machines. After a workout, many people get up and leave or go to another machine but leave the machine all sweaty. Sweaty machines encourage the spread of germs and create a disgusting sight for the next person. Next time you use a machine at the gym bring a towel with you so after your workout you can clean up after yourself. We all have bad days where people cut in front of us in lines or give us the wrong order at the drive-thru. But at the gym, if someone has the machine you want to use, don’t stare at them in an intimidating way or tell them to get off. Politely tell them you would like to use the machine or ask them if they would mind if you worked with them. Asking nicely creates a positive and friendly atmosphere in the gym instead of a negative vibe. It’s known that people have to rest in between sets due to the intensity of the workout. But sitting on the equipment to catch your breath while a person’s waiting on the machine is rude. If the gym’s busy and you know you need time to recover after sets why not take turns with another person? Taking turns will allow both you and another person to share the equipment while at the same time getting a nice workout too! While most gyms have free weights, they are not always easy to find. Sometimes you have to go on a scavenger hunt throughout the gym to find the weight you want. That’s why it’s crucial to re-rack weights and plates after you used them. Looking for lost weights is a time waster. When dealing with heavy plates, some people don’t even bother to take them off of the machines after they have finished. For the next person dealing with a certain machine, not only does it waste time but it can be a hassle. A gym is not for business deals, mom gossip, or teenage drama. The gym is for people who want to work out. People do not want to overhear about your fiancé’s bills or your supermarket nightmare. So, it’s best that all phone calls be taken outside the gym where you can handle your personal matters privately. When the gym is busy of course, there will be a level of space that you’re not privy to. However, when the gym isn’t busy, you should feel comfortable. A person shouldn’t pick a machine right next to yours in a room full of empty machines or decide to pour their gym bag out on the bench in the locker room. Both of those examples display thinking of no one else except yourself. People should be considerate of others and their needs to move throughout the gym. Some clothes should not be worn to the gym. At the gym, you strengthen your muscles and work out parts of your body. Gym clothes require certain flexibility and a weightless feel to them. While some clothes may feel like the right clothes to wear they might show too much of your body. You don’t want to flash someone while you’re working out accidentally. So, make sure your attire is secure and appropriate for the gym. There are many places where you can find such attire like online stores, fitness places, and name brand stores. A gym is a place where it’s socially acceptable to sweat. You shouldn’t walk in covered in a scent that tries to mask the smell of the sweat you’re going to end up smelling like. If you walk in smelling like flowers or coconut you will only be adding to the stink later on. It’s better to save your fragrances for a fancy event like a date, family outing, or a lunch with friends. The gym is no place for fancy perfumes. While it’s socially acceptable to take selfies about anywhere, one place it’s not is in the gym. Taking selfies of your toned abs or a picture of all the weights you’re going to lift can be looked at as self-absorbed. If you’re trying to make friends at the gym, it is suggested that you don’t take selfies. If you decided to take a fitness class that’s offered by the gym, you should listen to the instructor. If you make up your own routine while the rest of the class is following the instructor, it can not only throw some of the other students off, but it’s disrespectful. The instructor has put time and energy into developing fun and intense or a non-intense workout. You should follow instructions after all, depending on the type of class, it might have cost you. If you start following these simple gym rules, you’ll notice that you’ll have a better workout. Have fun!